Sodium Nitrate: Say No to Cancer! We’ve all seen the heart breaking images of young children with cancer. It’s terrible and heart wrenching! Did you know that there are additives being used in the foods we feed our children that are known to increase the risk of cancer, especially in children? One of these, Sodium Nitrate, is used as a preservative and for flavor in many processed meats, such as hot dogs and the meats in Lunchables. Why is Sodium Nitrate Used? There are many reasons that Sodium Nitrate is used: for preserving the meat, avoid bacterial growth, flavoring, and to improve the color of the meat. According to the giants in the food industry, using sodium nitrate is necessary in order to keep meat fresh; and customers tend to buy more meats if the color looks fresh and pink. Where is Sodium Nitrate Found? Because it is used as a preservative, sodium nitrate is found in any processed meat or product with processed meats in it. This includes bacon, ham, turkey, hot dogs, lunchables (bet you thought those were healthy for your kids!) and soups with meats. Why is Sodium Nitrate Unsafe? First of all, while sodium nitrate is toxic to all of us, it’s more dangerous to children because their bodies react faster. Our digestive systems convert it into carcinogenic nitrosamines, which are known cancer agents. Sodium nitrate has been linked to increased risks for colon cancer, stomach cancer and pancreatic cancer. In addition, pregnant women who eat a lot of processed meat give birth to babies who will have an increased risk of brain tumors as children. This is pretty scary! If you watch TV, you know about the increased number of children with cancer…this is one cause. Our society is too “busy” to cook home-cooked meals anymore! 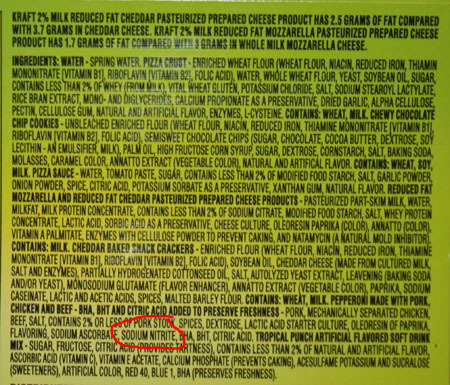 Therefore, most families are eating the poison of sodium nitrite in processed foods! My husband, who just happened to be reading over my shoulder as I’m writing this, just asked me if I expect him to stop eating meat! Of course not! Not all of these meats contain sodium nitrate. Check the labels in the supermarket before you buy. Of course, one option is to not to eat processed meat at all. Buy your meat from local farmers who raise grass-fed cattle and free range chicken. However, many families are unable to afford this option, because organic food is expensive. Just check the labels on everything before you buy to make sure it doesn’t contain anything that will harm your children! Starting a site kind of similar to yours forced me to get into some research and I found your post to be quite helpful. My site is centered around the idea that you can starve cancer by stopping the angiogenic process. I wish you good luck with your work in the future and you can be sure I’ll be following it.